Low-cost interface designed exclusively for use on cars based on Mk.5 Golf technology. See list of compatible cars below. This interface is not backwards compatible with older cars using K-lines for diagnostics, and it is not compatible with some Audi models. Acts as a "dongle". A license for VCDS is embedded in this this interface, so VCDS is will always be always fully-functional on any PC that meets our requirements. This interface comes with an OBD-II type connector which plugs directly into all VW, Audi, Seat, and Skoda cars which are compatible with this interface. This interface is compatible only with cars with diagnostics based on Mk.5 Golf technology. If your car's chassis type isn't on this list, it's not compatible with this interface! All of these chassis-types are the latest generation of that model. Previous generations of the same model are not compatible and should use a KII- or HEX- series interface instead. If you're not certain, please check your car's VIN. The 7th and 8th digit have the chassis code. For example: WAUMF78P06A0NNNNN is an 8P-chassis Audi A3. 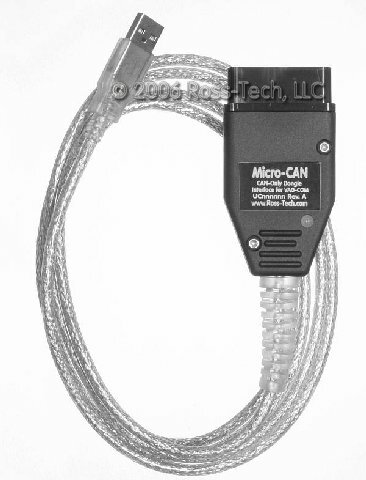 The Micro-CAN does not support Turbo Mode, the Clear All DTCs function or Activating/De-Activating Transport Mode. A HEX-USB+CAN or newer interface is needed for those functions. We recommend at least a 1 GHz Pentium-3 (or AMD equivalent) with 128 MB of RAM and Windows XP or newer. Windows Vista, 7, 8, or 10 on a machine robust enough to support the respective operating system are also fine. As of version 10.6, we no longer support Windows 95, 98, ME or NT4. If you're using a PC that has a CPU speed less than 1 GHz and which has a Serial port, then you should consider the Serial HEX-COM+CAN instead. The cable on this interface is about 6 feet long -- just right for most laptops. The USB standards do not allow for passive extension cords! We have tested many Active USB extensions and have found one that works. You can order the 16-ft Active USB Extension from our Store. We do not sell or support any other brands or models of USB extensions, if you have problems when using one, the first thing we're going to tell you is to eliminate the extension. The Micro-CAN acts as a "dongle" for VCDS, so VCDS should be fully functional on any PC when used with this interface. However, product support is provided only to the original purchaser. If you buy a second-hand Micro-CAN from someone and want support, you'll still need to pay $99 to register. The Micro-CAN must be used with a current version of VCDS. It does not work with VCDS-Lite. This interface requires a special driver to be installed on your PC. It does not emulate a COM port. That means this interface will not work with any other software besides VCDS. We do not sell any interfaces as a "Stand-Alone" products. We only sell them with our VCDS software. Click here for complete driver installation instructions.